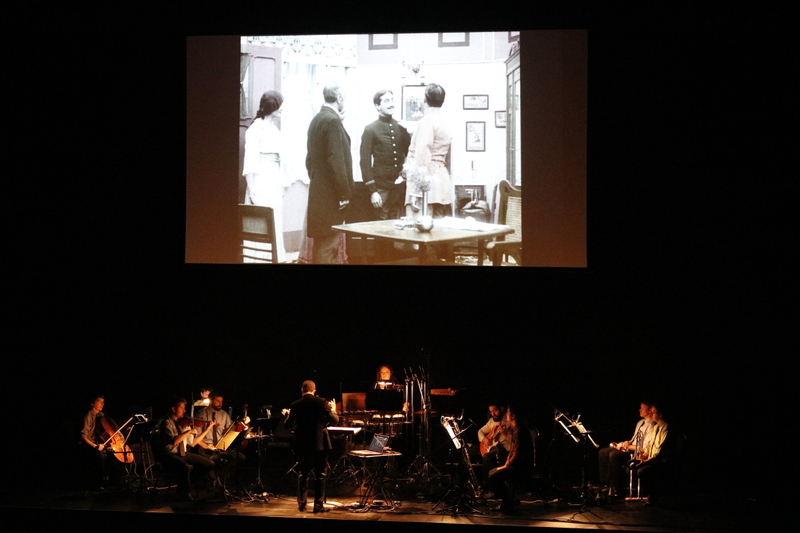 Argonaut Ensemble perform Olga Neuwirth’s live score to Maudite soit la guerre. Photo by Marty Williams. Scenes of war flicker across a screen in a darkened hall. Repetitive percussion drills like gunfire and strains of a honky tonk piano emerge from under shimmering strings. This is the sound of Maudite soit la guerre (War is Hell), one of the first anti-war films. The 1914 motion picture juxtaposes tradition with the unexpected arrival of a mechanical age of war. Similarly, Austrian composer Olga Neuwirth’s live score bridges the divide between conventional instrumentation and innovative performance techniques. The film interprets the turmoil of war through the narrative of a doomed love story and two rival aviators. Neuwirth was commissioned by Ensemble 2e2m in 2014 to compose a soundtrack and the Argonaut Ensemble interpreted the score with a spellbinding balance of delicacy and vigour. Eric Dudley conducted with subtle gestures to foster an ensemble dynamic that bristled with energy. Neuwirth’s score is unique as far as film music goes in that the image and sound sometimes do not correlate. At one point a windmill crashes to the ground, but there’s no literal effect to signify this. It was intriguing to witness the way in which our reactions were shaped by what we heard more so than what we saw, in particular when comical salon music drew laughter from the audience while characters on screen were departing for war. Violinist Zachary Johnston, violist Christian Read and cellist Paul Zabrowarny excelled, playing cowbells as well as their usual instruments. Roughly bowed string motifs and airy harmonics created an electric atmosphere. Trumpeter Tristram Williams and trombonist Benjamin Marks delivered crisp notes before shifting into rich echoes of military fanfare. Marks even picked up a melodica to add comic effect to the already diverse world of sound, and electric guitarist Mauricio Carrasco emulated eerie air raid sirens with rising and sinking glissandos. Neuwirth draws on a range of textures and instrumentations to create a dramatic mix of electronics, classical instrumentation and film. Maudite soit la guerre predominantly features soundscapes over melodic continuity, often with dense passages of limited dynamic range. Neuwirth’s musical theatre works frequently explore the relationship between collaboration and resistance, and that was identifiable in this performance through the overlapping textures and conflicting musical and visual themes. The film’s director, Alfred Machin, produced this work with the intent to counteract the typically glamorised war propaganda that saturated society leading into the First World War. Neuwirth says of the film, ‘You always need to remember the past! That is the only way that we could learn something’. The Argonaut Ensemble embraced Neuwirth’s philosophy with this performance that honoured the ANZAC Centenary, reminding us of the harrowing emotions generated by war through the frame of an explorative soundscape.